Its raining mangoes pickles at Sailu’s Kitchen. 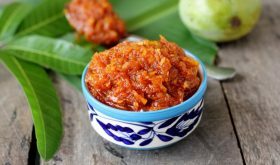 Today, I bring to you another gem of Indian regional cuisine, aam ka chunda aka chundo, a Gujarati sweet mango pickle recipe and a close cousin to mango chutney recipe or aam ki launji. 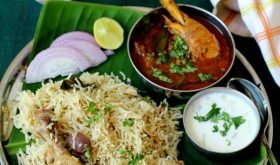 Most of Western and Northern parts of India make a sweet achaar with grated raw mangoes that are sour and sugar or jaggery. 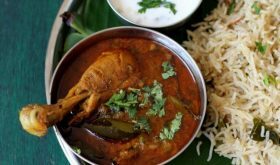 Based on the region it is prepared the spices used in making the chunda differ sligthly. 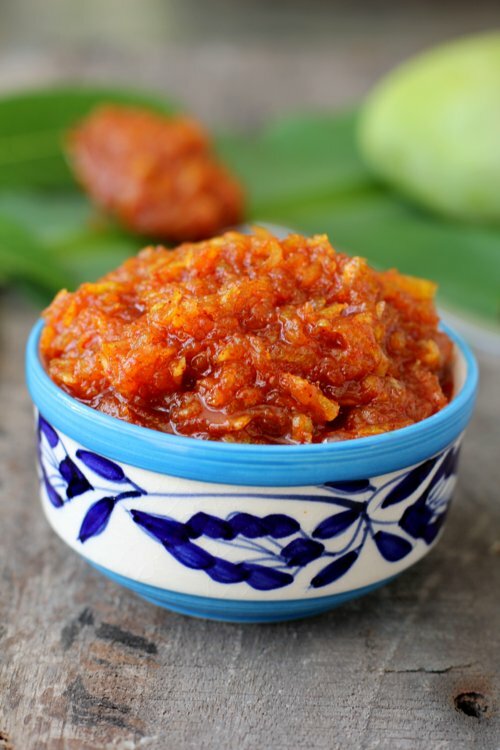 Its lip smackingly good, addictive mango pickle that can be slathered over toast, used as a dip with mathri, chips or corn chips and a side with paratha, rotis. 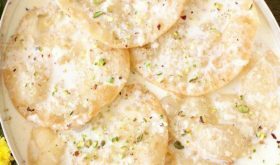 Traditionally it is served with Gujarati chickpea flour (besan) based snacks like thepla (methi flatbread), fafda, ganthia and khari puri. The ultimate combination is chundo with thelpa. The traditional way to make aam ka chunda or chundo is by sun drying method. It is a time taking process but not laborious. Grated mangoes and sugar are mixed and sun dried for a week to ten days till the sugar takes a thick syrupy texture. Minimal ingredients and high on flavor. 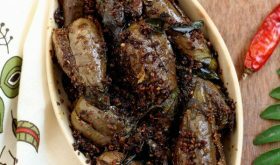 I have prepared the traditional method but you can follow the short cut method to make this gujarati sweet mango pickle recipe by cooking it over stove top. 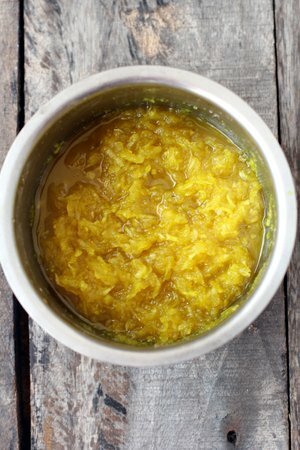 This pickle is instant, quick to make and equally tasty as the sun dried method. To cook over stove top, follow the ingredients with same quantities mentioned in aam ka chunda recipe. Heat a heavy bottomed pan on low flame, add grated mango, cloves, cinnamon and sugar. Cook on low flame stirring continuously till sugar dissolves. The mixture will become thin. You will find bubbles appearing on the surface and and as they subside, continue to cook such that the mixture become slightly thick. This could take quite sometime, so please be patient. Do not over cook as it will crystallize. Turn off flame and allow the mixture to come to room temperature. The mixture will thicken on cooling. Add salt, chili powder and roasted cumin powder and mix. 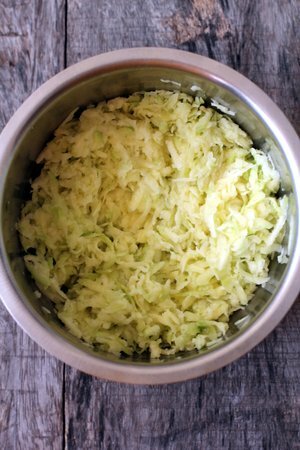 Remove to a sterilized bottle and refrigerate. 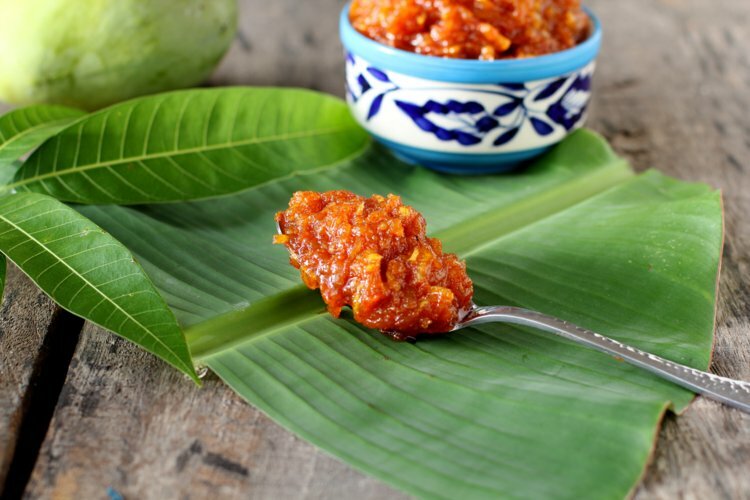 Sweet mango pickle is ready to be consumed the moment it is cooked. Place grated mangoes in a bowl, add tumeric powder and salt and set aside for an hour. The mixture will leave water. Place this mixture in a muslin cloth and tie it at a height and allow the liquid to drain through. Discard the liquid. 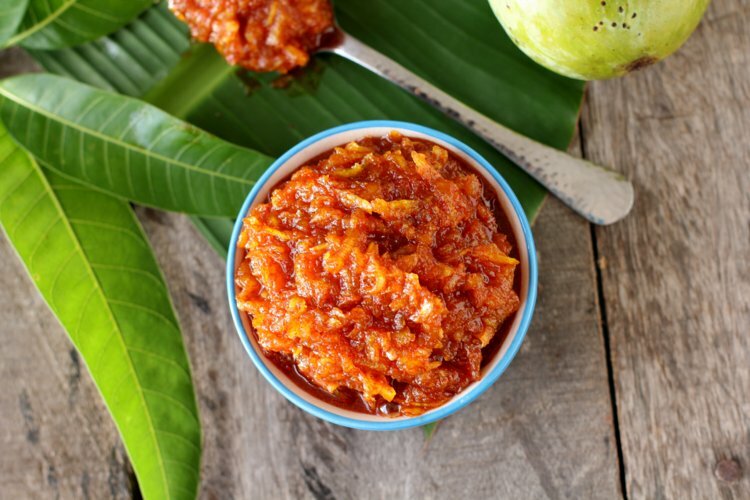 Remove the grated mango to a wide bottomed vessel with a rim and add sugar or grated jaggery. Mix well with a clean, moisture free ladle. Tie a muslin cloth on top of the vessel and place in the sun for one week or till the sugar is completed melted and becomes a sticky syrup. This could take 5-10 days based on the summer heat. At the end of each day, bring the vesesl indoors and place a lid. Next day, stir the mixture with a clean, moisture free ladle and place it back in the sun by covering with a muslin cloth that is tied along the rim. Follow steps 4, 5 and 6 every day. Once the mixture reaches a sticky syrup (double string consistency), add red chili powder, roasted cumin powder, cloves and cinnamon stick and mix well. Remove to a sterilized bottle and store at room temperature. The pickle is ready for consumption. It has a long shelf life. Use absolutely green raw mangoes that are sour. Even slighly ripe mangoes will not work for this recipe. Sugar can be adjusted based on how sour the mangoes are. If very sour, increase sugar quantity. By Sailu Published: May 5, 2015 Aam ka chunda, a Gujarati sweet mango pickle recipe aka chundo is made by sun drying raw mango & sugar. 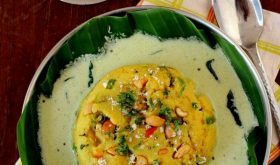 How to make aam chunda,a gem among Gujarati recipes.